June 2016 - Our new website offers a smarter choice for your customers to instantly get product support material from the field. The redesign is more mobile-friendly and accommodates the use of tablets and smart phones to navigate the website. "System Integrators and others are increasingly accessing product information from the field using mobile devices. Time is money so being able to quickly get product information is key. 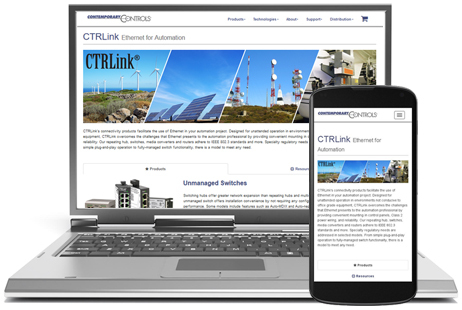 Our product pages contain all the necessary documentation and support to make accurate and informed decisions," states Joe Stasiek, Sales Manager, Contemporary Controls. The new website also offers larger, higher resolution product pictures that can simply be copied and pasted into distributor websites and presentations. Let your customers know about our redesigned website and the benefits of it being more mobile-friendly.